This book has a stunningly beautiful cover and you’ll find a real treasure trove of delights inside. As someone who is fascinated by words and where they come from, this was the perfect book for me to dip in and out of. I follow the author on Twitter (where he is also known as Haggard Hawks) and love reading the obscure and often forgotten words his account shares every day. It is fascinating to see what words have fallen out of use and how they were used in days gone by. It is also very amusing when the word of the day just happens to be very appropriate for current political situations. Some of the tweets during the US Presidential campaign and the Brexit referendum were positively inspired! 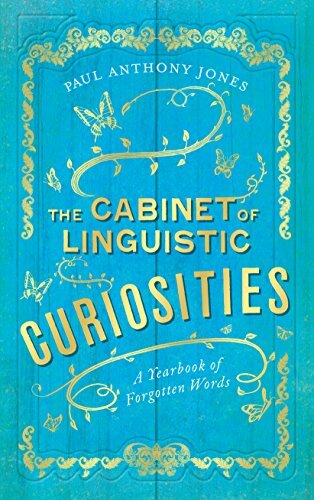 The Cabinet of Linguistic Curiosities has a word per page for each day of the year. As well as defining the word, the author has an anecdote or further explanation to go with each. There has obviously been a huge amount of research carried out in order to make this such a readable and fascinating book. To give you a flavour of the book, I’m going to look at a couple of dates and a few words. First of all on 5th March (yes, my birthday) the word of the day is zawn which is a fissure or cave in a coastal path. This day’s entry goes on to talk about St Piran, patron saint of Cornwall as 5th March is his feast day. I did know that but didn’t know anything else about him so that was really interesting to read. Zawn comes from the Cornish language and there is also some information about Cornish including the fact that the last native speaker died way back in 1777, much longer ago than I would have thought. Today’s word is a cracker – xenotransplantation. This is the transplantation of non-human material into a human patient. Along with this word, we learn of one of the first such transplants in 1984 when a young girl received a baboon’s heart. Sadly she only survived for another two weeks but as we know, it is now possible for xenotransplantation to take place with pig valves often used in heart surgery. Other words that really caught my fancy were letterling (a short letter or note – 3rd August), lickpenny (a costly enterprise – 30th March), love-light (a romantic glimmer in a person’s eyes – used, if I recall correctly, in Eric Clapton’s ‘Wonderful Tonight’ and the word for 12th October) and brolly-hop (a parachute jump – 22nd October). It really amuses me that the quite long word breviloquent (4th March) means pithy or succint, characterised by brevity of speech. There really is a huge collection of fascinating, entertaining and enlightening words in this book, just waiting to be discovered. Now, although I may normally be theic (see above) if you’ll excuse me I’ll just have a stirrup-cup and take my leave. That’s 11th December – you’ll have to buy the book to find out exactly what that means! My thanks to Alison Menzies and Elliot and Thompson books for sending me a copy of this book and to Kate (aka The Quiet Knitter) for recommending me to Alison. The book is available now in beautiful hardback or an an ebook. It is available in good bookshops or you can order a copy online by clicking here. Thanks, it’s a fabulous read. Think there might be a giveaway elsewhere on the your so worth checking. Absolutely loved it. Well, loving it really as like you, dipping in and out.